This article first appeared in The Edge Financial Daily, on December 13, 2018. KUALA LUMPUR: Both former prime minister Datuk Seri Najib Razak and the former chief of 1Malaysia Development Bhd (1MDB) Arul Kanda Kandasamy claimed trial to tampering with the audit report on the troubled state invesment fund, where billions of ringgit had allegedly been siphoned off before the report was finalised and submitted to the Public Accounts Committee. 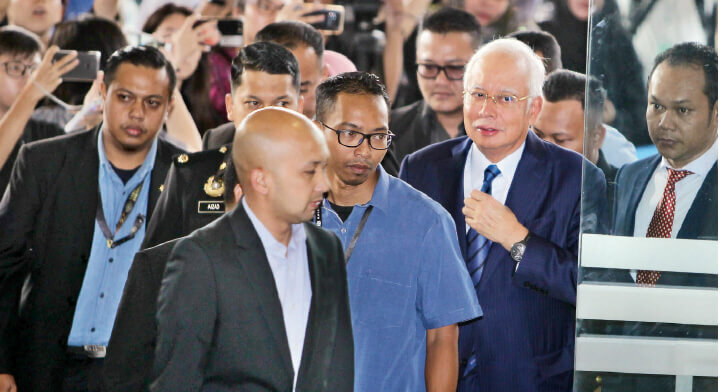 Clad in a blue suit, Najib arrived at the Jalan Duta Courts Complex at around 8.45am, when he was swamped by pressmen, before appearing before Sessions Court Judge Azura Alwi. Arul Kanda appeared at the courthouse about 45 minutes before Najib after being held overnight by the Malaysian Anti-Corruption Commission following his arrest on Tuesday. 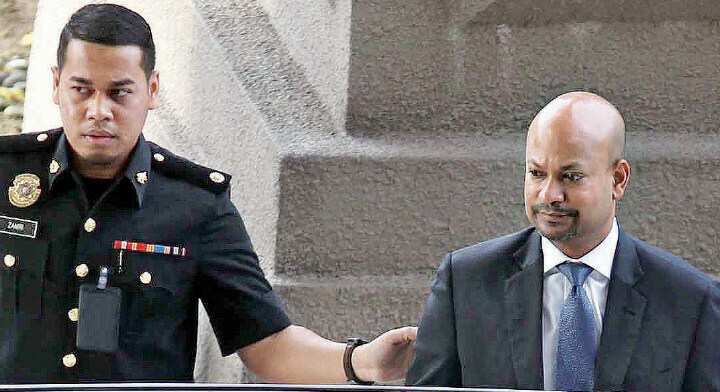 Arul Kanda, who helmed the controversial fund as its president and chief executive officer from January 2015 until he was sacked in June this year, pleaded not guilty before Sessions Court Judge Rozina Ayub to one charge of abetting Najib in tampering with the audit report. He was granted bail of RM500,000 with one surety. Arul Kanda’s lawyer N Sivanathan tried to get the bail paid in two instalments between yesterday and today by arguing that Arul Kanda was now unemployed and needed time to raise the sum in full. However, this was objected to by deputy public prosecutor Ahmad Akram Gharib. Arul Kanda posted the bail in full after that. Najib, meanwhile, pleaded not guilty to one charge of abusing his position as the prime minister to avoid a civil or criminal action after giving the order to alter the final audit report on 1MDB. He was also formerly the chairman of the fund’s advisory board. His bail was initially set at RM1 million, also with one surety, before his lawyer Tan Sri Muhammad Shafee Abdullah objected to it, saying the amount was excessive compared with the bail set for Arul Kanda. “My client has already paid RM5.5 million for his previous cases,” said Muhammad Shafee, adding that bail should never be oppressive. In response, lead prosecutor Datuk Seri Gopal Sri Ram argued that Najib was charged as the principal offender, while Arul Kanda was charged with abetment, and that the principal offender had always been treated differently. Azura subsequently lowered Najib’s bail to RM500,000. Both the accused allegedly committed the offences between Feb 22 and Feb 26, 2016, at the Prime Minister’s Office in Putrajaya. The mentions of both cases were set for Jan 4 next year. Neither men spoke to the press after the court proceedings. It was the first time Arul Kanda was charged in relation to 1MDB. The ex-1MDB chief toured the country prior to the May 9 general election — which saw the toppling of the Najib-led Barisan Nasional (BN) government — to explain that all was well at 1MDB via a series of “You Ask, We Answer” sessions. As for Najib, who has been in and out of the courthouse to face various graft charges since BN lost power, is now facing a total of 39 charges, with 38 of them being charges of money laundering, abuse of power and criminal breach of trust involving 1MDB and its former subsidiary SRC International Sdn Bhd. Both Najib and Arul Kanda’s charges fall under Section 23(1) and Section 28(1)(c) of the Malaysian Anti-Corruption Commission Act 2009 respectively. If convicted, each can be jailed up to 20 years, as well as fined no less than five times the amount of gratification received — provided that it can be valued in monetary terms — or RM10,000, whichever is higher. The alleged tampering with the final audit report on 1MDB was revealed by Auditor-General Tan Sri Dr Madinah Mohamad on Nov 25, when she issued a statement chronicling the sequence of events and the amendments made to the report after she briefed the cabinet on the matter two days earlier. Two key amendments she revealed were the removal of a paragraph or paragraphs stating that businessman Low Taek Jho (Jho Low) had attended a meeting of 1MDB’s board of directors, as well as the removal of a paragraph or paragraphs stating that there were two versions of 1MDB financial statements for the year ending 2014. Jho Low, has been described by US prosecutors as the central figure behind the billions that went missing from 1MDB. The fugitive businessman, who is facing charges in Malaysia and the US in connection with 1MDB, has denied any wrongdoing.